It may not surprise you that trees planted in the ground produce more fruit than those in containers and especially those cultivated indoors. But that doesn’t take away from the uniqueness of these trees. They can add some novel beauty to your indoor plant collection! How Did they Become Miniature Trees? The answer is grafting, which is performed in a plant nursery. In this case, grafting is the process of inserting the stem of a fruit tree onto the roots of another tree (in this case, a miniature tree) so that the tissues fuse together. To promote good drainage, be sure to pot containing the tree has a hole for drainage and the soil contains some perlite. These trees like bright, direct light, so find a spot near a window with western or southern exposure. All trees described here except the olive crave humidity, so mist them regularly. The same goes for watering. Citrus trees especially require routine watering. Citrus trees are heavy feeders, so find a fertilizer specifically for citrus trees. 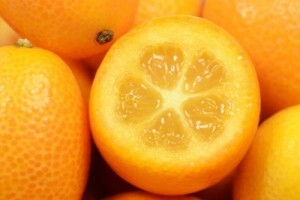 The kumquat is a citrus tree believed to have originated in China. Miniature versions are grown as much for their ornamental value as for their fragrant white blossoms in spring and summer and oval shaped, bright orange, tart-tasting fruit. The most common variety is the Nagami Kumquat, but a kumquat-mandarin hybrid, the Indio Mandarinquat bears much larger fruit. Even the skin of the fruit is edible. This one is pretty easy to find at plant nurseries and is remarkably, well, fruitful. Their dense growing habit makes them resemble a shrub, but the fruit is edible. This is the slowest growing of all the plants listed here. But what a beauty, with their small, uniform gray-green leaves. Just don’t expect to harvest olives. Prune it occasionally to maintain the typical “ball on a stick” shape. Its Mediterranean heritage means it is accustomed to dry conditions and at least six hours of sun daily. Be sure to keep it away from heat vents and radiators, or not too close to windows, so the leaves don’t burn. While technically not a tree, the banana plant is the showiest of all the specimens listed here. A large stalk supports a brilliant pink pod, covered in large, cup-shaped petals. One after another, the petals peel away from the pod to reveal a tight clump of stunning flowers. The flowers then grow into tiny – but inedible – bananas. This is a tropical plant, so it needs even more light than the others mentioned in this blog entry.